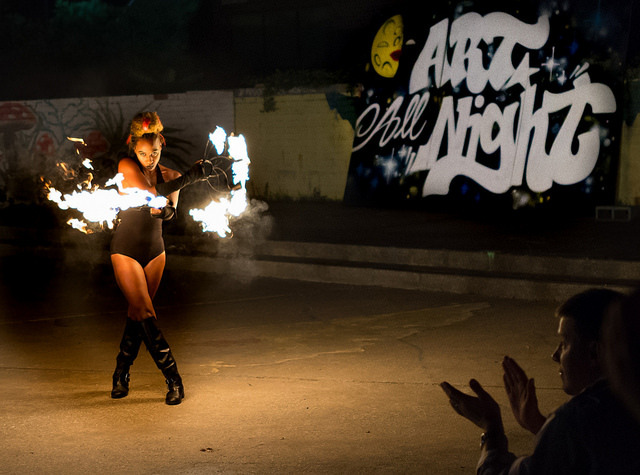 PoPville » Art All Night will be in 8 Neighborhoods this year – September 29th!! Art All Night will be in 8 Neighborhoods this year – September 29th!! “The District’s only free all-night arts festival, Art All Night, returns on Saturday, September 29 with a new lineup of visual and performing arts exhibits, workshops and performances. The Department of Small and Local Business Development (DSLBD) and D.C. Commission on the Arts and Humanities (DCCAH) are sponsoring the festival presented by the Main Streets Programs in Congress Heights, Deanwood Heights, Dupont Circle, H Street, Minnesota Avenue, North Capitol, Shaw and Tenleytown, highlighting the most innovative and creative artistic forces in the city for the annual around-the-clock experience. Mayor Muriel Bowser and other city officials are expected to celebrate D.C.’s local arts scene throughout Art All Night. From 7 p.m. on September 29 until 3 a.m. am on September 30, artists and arts enthusiasts can bounce around the city experiencing painting, photography, sculpture, crafts, fashion, music, dance, theater, silent discos, film and poetry in a variety of unique indoor and outdoor spaces located throughout Washington. Dupont Circle:Take a stroll through Dupont’s art galleries, embassies and retailers. Dupont Circle is home to world-class museums, think tanks, and ambassador’s residents. Some special locations will be open for you to discover fine art and entertainment. Shaw:Enjoy eight hours of indoor and outdoor events across the neighborhood where Art All Night DC started in 2011, complete with live music, dance, painting, body painting, photography, film, fashion and DIY activities. Shaw is home to the largest number of artists, performers and venues at the annual festival. This year’s theme is #ShawGlows, which will be reflected in a large number of installations and interactive events using neon, black lights, and other colorful visual effects. Highlights include parades, an art market, fire dancers, dance parties, new murals, projections, and free glow-in-the-dark giveaways.